The truck has a well equipped kitchen, full size gas cooker and large dining area with plenty of storage, as well as a wood or gas heated shower. The cosy living room has a woodburning stove, and the box bed looks out of a large circular window with views of the fields and mountains beyond.There are LED lights throughout, powered by solar panels - this is true off-grid living.Even the outdoor compost toilet - a few yards from the truck, had a great view. The truck has 12volt sockets for phone charging, but this is a proper off-grid getaway and you won't find wifi or mains electricity. There is also no fridge, but we provide a cool box which can be plugged into the truck, and ice packs can be changed daily. 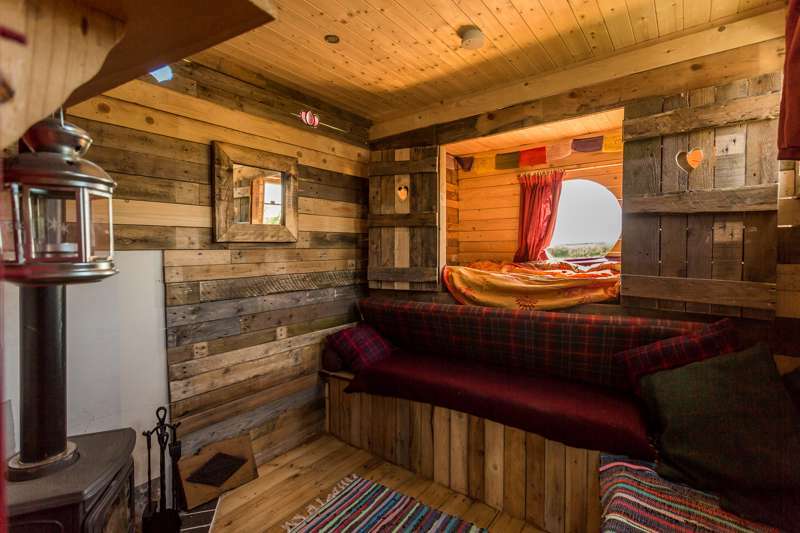 Unplug and unwind in our off-grid horsebox here at Lackan Cottage Farm, in the beautiful County Down countryside with great views of the Mourne Mountains. Tucked away in a private corner of our smallholding, this truck - once our home - has been lovingly refurbished with recycled and local materials. A cosy, comfy hideaway you won't want to leave. This is proper off grid life, so no mains power, and no wifi. This truck was once our home, and when we renovated Lackan cottage, we refurbished the truck with love - it is created with unusual and reclaimed materials, heated with wood, and a really cosy, comfy space. It sits in a quiet corner of our six acre smallholding, with it's own little herb garden, willow plantation, and a deck that looks over to the Mourne Mountains. It is like being in a little world of your own. It is great to lie in the box bed and look out at the view, or sit out back on the deck with the chiminea lit and watch the sun go down. Stay in the truck if you want to unplug from mobile devices and the daily grind, and escape to a unique space in nature. As well as your own private space, you can explore our own private woodland, pick your own fruit and veg, and walk in the beautiful County Down countryside. Our guests frequently say they wished they had stayed longer. The truck has a kitchen diner, with a gas hob, grill and oven; plenty of utensils, and a big seating area with a table. You'll also find a coolbox which can be plugged in. Beyond that is the small lobby, and a shower room. At the back of the truck is the living room with cosy woodburner, and a box bed with a great view out over the countryside. All finished in reclaimed timbers. We're situated in rural County Down, just a few miles from nearby forest parks, the amazing Mourne Mountains, and of course, the sea. Visitors can enjoy the tranquility of our own birch woods, and walk in the gardens. There are also a number of great local walks, one through the Lackan Bog Area of Special Scientific Interest where you will find the highest number of dragonfly species anywhere in Ireland. We have on-site parking, and bike hire is available from the Life Centre in Castlewellan Forest Park. The nearest bus station is Rathfriland, 5 miles away, and we can arrange pickups from there or Castlewellan if you are travelling by public transport.